It's hard to believe the twins are a year old already. It seems like the baby shower was just yesterday. They grow so quickly. We didn't have a nice sash like the Mom To Be SASH for their mom to wear at her baby shower, but this Beautiful Mom To Be Blue Sash with Silver Glitter will be worn by the newest mom to be on my list who is expecting a baby boy soon. This is a nice satin sash adorned with silver glitter. 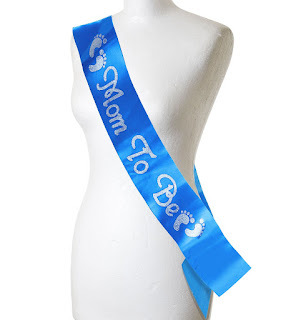 It is perfect for any expectant mother with a boy on the way. It makes a nice addition to your next baby shower, and is also available in pink for girls.